Work or relax, in efficiency and ease; whether you're on the couch, at the airport or your local coffeehouse. 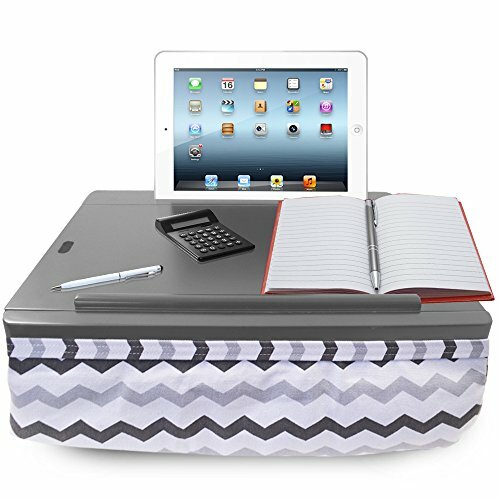 The iCozy lap desk makes working so much more convenient and comfortable than a backpack. Slide the top off to reveal the three compartments that will hold all the office supplies you'll need for a day's work. The carrying handle makes it as easy to transport your stuff as a briefcase, and with its bean bag cushion that customizes its fit to you, it's a lot more comfortable to work on! Ready for leisure pursuits as well! Take your summer reading, some snacks and sunglasses to the beach, the pool or just your backyard. Or pop some crafting supplies in and work on your small scrapbook or crochet project while you watch your child work off some energy at the playground before joining you in some artwork. The iCozy lives up to its name, and has utility to spare. ERGONOMIC AND COMFORTABLE ANYTIME, ANYWHERE: The iCozy lapdesk lives up to its name: no matter where you go, the microbead cushion at the bottom offers cozy, ergonomic, customizable working comfort. You'll be so comfortable you'll need to set reminders to take breaks! OFFICE? YES. HANDY LEISURE READING AID? YEP: With three built-in compartments for stashing your tablet, notebook (the paper kind) and small office supplies, not to mention a paperback novel and sunglasses, you're ready for work or a day by the pool. AMPLE WORKTOP FOR ANY SIZE COMPUTER: Whether it's a tablet or a full-blown laptop with a 17 inch screen, this versatile lap desk will accommodate whichever portable computer type you want or need to use. Anywhere.